Sicily (Italian and Sicilian: Sicilia; Greek: Σικελία, Sikelia) is an autonomous region of Italy and the largest island in the Mediterranean Sea, with an area of 25,708 km² (9,925.9 square miles) and over 5 million inhabitants. Its capital city is Palermo. Sicily is the largest Mediterranean island and is directly adjacent to the region of Calabria via the Strait of Messina to the east. 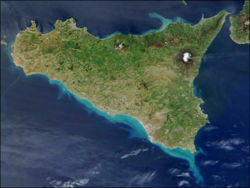 The early Roman name for Sicily was Trinacria, alluding to its triangular shape. The volcano Etna, is situated close to Catania. Etna is 3,320 m (10,900 ft) high, making it the tallest volcano in Europe. It is also one of the world's most active volcanoes. The Aeolian islands to the north are administratively a part of Sicily, as are the Aegadian Islands and Pantelleria Island to the west, Ustica Island to the north-west, and the Pelagian Islands to the south-west. Sicily has been noted for two millennia as a grain-producing territory: olives and wine are among its other agricultural products. The mines of the Caltanissetta district became a leading sulfur-producing area in the 19th century, but have declined since the 1950s. The original inhabitants of Sicily, long absorbed into the population, were tribes known to Greek writers as the Elymians (who, according to Thucydides, were descendants of Trojan refugees), the Sicani and the Siculi or Sicels. Of these, the last were clearly the latest to arrive on this land and were related to other Italic peoples of southern Italy, such as the Italoi of Calabria, the Oenotrians, Chones, and Leuterni (or Leutarni), the Opicans, and the Ausones. It's possible, however, that the Sicani were originally an Iberian tribe. 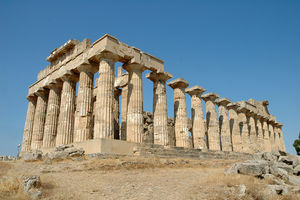 Sicily was colonized by Phoenicians and Punic settlers from Carthage and by Greeks, starting in the 8th century BC. The most important colony was established at Syracuse in 734 BC. Other important Greek colonies were Gela, Agrigentum, Selinunte, Himera, and Zancle or Messene (modern-day Messina, not to be confused with the ancient city of Messene in Messenia, Greece). These city states were an important part of classical Greek civilization, which included Sicily as part of Magna Græcia - both Empedocles and Archimedes were from Sicily. Sicilian politics was intertwined with politics in Greece itself, leading Athens, for example, mount the disastrous Sicilian Expedition during the Peloponnesian War. The Greeks came into conflict with the Punic trading communities with ties to Carthage, which was on the African mainland not far from the southwest corner of the island, and had its own colonies on Sicily. Palermo was a Carthaginian city, founded in the 8th century BC, named Zis or Sis ("Panormos" to the Greeks). Hundreds of Phoenician and Carthaginian grave sites have been found in necropoli over a large area of Palermo, now built over, south of the Norman palace, where the Norman kings had a vast park. In the far west, Lilybaeum (now Marsala) never was thoroughly Hellenized. In the First and Second Sicilian Wars, Carthage was in control of all but the eastern part of Sicily, which was dominated by Syracuse. In the 3rd century BC the Messanan Crisis motivated the intervention of the Roman Republic into Sicilian affairs, and led to the First Punic War between Rome and Carthage. By the end of war (242 BC) all Sicily was in Roman hands. The initial success of the Carthaginians during the Second Punic War encouraged many of the Sicilian cities to revolt against Roman rule. Rome sent troops to put down the rebellions (it was during the siege of Syracuse that Archimedes was killed). Carthage briefly took control of parts of Sicily, but in the end was driven off. Many Carthaginian sympathizers were killed—in 210 BC the Roman consul M. Valerian told the Roman Senate that "no Carthaginian remains in Sicily". For the next 6 centuries Sicily was a province of the Roman Empire. It was something of a rural backwater, important chiefly for its grain-fields which were a mainstay of the food supply of the city of Rome. The empire did not make much effort to Romanize the island, which remained largely Greek. The most notable event of this period was the notorious misgovernment of Verres. In AD 440 Sicily fell to the Vandal king Geiseric. A few decades later it came into Ostrogothic hands, where it remained until it was conquered by the Byzantine general Belisarius in 535. But a new Ostrogoth king, Totila, drove down the Italian peninsula and then plundered and conquered Sicily in 550. He in turn was defeated and killed by the Byzantine general Narses in 552. Sicily was then ruled by the Byzantine empire until the Arab conquest of AD 827-965. For a brief period (662-668) during Byzantine rule Syracuse was the imperial capital, until Constans II was assassinated. It is reported in contemporary accounts that Sicilians spoke Greek or Italo-Greek dialects until at least the 10th century, and in some regions for several more centuries. The cultural diversity and religious tolerance of the period of Muslim rule under the Kalbid dynasty continued under the Normans who conquered the island in 1060-1090 (raising its status to that of a kingdom in 1130), and the south German Hohenstaufen dynasty which ruled from 1194, adopting Palermo as its principal seat from 1220. In 1061 the Normans, under Robert Guiscard and his brother Roger I of Sicily, began the conquest of Sicily, completed in 1091. In 1127 Roger II, count of Sicily, was recognized as duke of Apulia and Calabria, and in 1130 he assumed the title of king of Sicily. Local Christian-Muslim conflicts fueled by the Crusades were escalating during this later period, and in 1224, Frederick II, grandson of Roger II, expelled the last remaining Muslims from Sicily, temporarily relocating many to a colony in Lucera on the southern mainland, while the rest fled to North Africa. Conflict between the Hohenstaufen house and the Papacy led in 1266 to Sicily's conquest by Charles I, duke of Anjou: opposition to French officialdom and taxation led in 1282 to insurrection (the Sicilian Vespers) and successful invasion by king Peter III of Aragón. The resulting War of the Sicilian Vespers lasted until the peace of Caltabellotta in 1302. Sicily was ruled as an independent kingdom by relatives of the kings of Aragon until 1409 and then as part of the Crown of Aragon. Ruled from 1479 by the kings of Spain, Sicily suffered a ferocious outbreak of plague (1656), followed by a damaging earthquake in the east of the island (1693). Periods of rule by the crown of Savoy (1713-1720) and then the Austrian Hapsburg gave way to union (1734) with the Bourbon-ruled Kingdom of Naples as the Kingdom of the Two Sicilies. The scene in 1820 and 1848 of abortive revolutionary movements against Bourbon denial of constitutional government, Sicily was joined with the kingdom of Italy in 1860 following the expedition of Giuseppe Garibaldi. In 1894 labor agitation through the radical Fasci dei lavoratori led to the imposition of martial law. Sicily was joined with the other Italian regions in 1860 following the invasion of irregular troops led by Giuseppe Garibaldi and the resultant so-called Risorgimento. The new Italian state was a strongly centralized nation, and it did not take long before, in 1866, Palermo revolted against Italy. The city was soon bombed by the Italian navy, which disembarked on September 22 under the command of Raffaele Cadorna. Italian soldiers summarily executed the civilian insurgents, and took possession once again of the island. A long extensive guerrilla campaign against the unionists (1861-1871) took place throughout southern Italy, and in Sicily, inducing the Italian governments to a ferocious military repression. Ruled under martial law for many years Sicily (and southern Italy) was ravaged by the Italian army that summarily executed thousands of people, made tens of thousands prisoners, destroyed villages, and deported people. The Sicilian economy collapsed, leading to an unprecedented wave of emigration. In 1894 labor agitation through the radical Fasci Siciliani led again to the imposition of martial law. Despite some economic development in the half-century after Italian unification, Sicily was largely bypassed by the industrial growth which transformed the larger urban areas of northern Italy. The organized crime networks commonly known as the Mafia extended their influence in the late 19th century (and many of its operatives also emigrated to other countries, particularly the United States); partly suppressed under the Fascist regime beginning in the 1920s, they recovered following the World War II Allied invasion of Sicily. An autonomous region from 1946, Sicily benefited to some extent from the partial Italian land reform of 1950-1962 and special funding from the Cassa per il Mezzogiorno, the Italian government's Fund for the South (1950-1984). The island returned to the headlines in 1992, however, when the assassination of two anti-mafia magistrates, Giovanni Falcone and Paolo Borsellino triggered a general upheaval in Italian political life. The position of Sicily as a stepping stone of sorts in the center of the Mediterranean Basin has lent it strategic importance throughout history, resulting in an endless procession of settlers and conquerors. Modern methods of genetic testing enable us to see which have had the greatest demographic impact. Several studies show strong ties between Sicily, mainland southern Italy and Greece, suggesting that the Siculi, Elymi and Greek colonizations were the most important, thus showing that the Sicilian people are descended mainly from Ancient Italic and Greek settlers. Sicily's population is approximately 5 million, and there are an additional 10 million people of Sicilian descent around the world, mostly in the United States, Argentina, Canada, Australia and the EU countries. This page was last modified on 2 June 2010, at 19:34.